"I am Temujin, ruler of the Steppes. I'll lend you my strength for the time being, but be warned; I do not take treachery lightly." Apply Fatal Poison to enemies at target. I am Temujin, ruler of the Steppes. I'll lend you my strength for the time being, but be warned; I do not take treachery lightly. Come on. Time to plunder. Your chance to surrender has passed. I'll return it a thousandfold! A beast that hunts to the ends of the prairies. A Ferocious Roar, Mani Hahn!! Victory. And now, to collect the spoils. Leave nothing behind. You should finish me now. Otherwise, I will surely kill you next time. A Transient from Xanadu, a world filled with grand plains, he is adept with the bow and arrow. The wolf king of the plains, Borte Chinoa the Great, and the white doe are the ancestors he is proud to honor. As heir to the leadership of his people, he has been summoned to Tokyo to expand his horizons as well as to build relationships at the Archery club while honing his archery skills. He respects those skilled in archery. A visitor who appeared from the gate to Xanadu, a world of vast prairies and steppes. 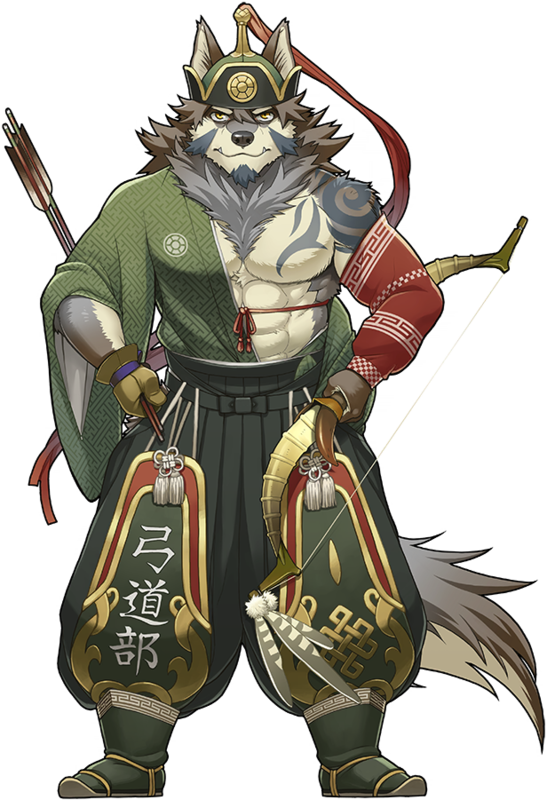 Temujin prides himself on his archery and lineage as a descendant of Börte Chino and Gua Maral the white doe. He has traveled through the gate to Tokyo to learn more about the inter-realm community, both for the sake of his duty as a future clan chieftain and as an opportunity to learn from masters of the bow from various other worlds, ever seeking to perfect his art. With the pride of a ruler and the persistence of an avenger, he will never let any traitor go unpunished, following them to the ends of the Earth to deal brutal revenge. His tenacity stems from having been betrayed by one close to him who he trusted deeply. Now, he has given up on open trust as a general rule. His Sacred Artifact is a divine bow which symbolizes the power of his ancestors. Its arrows home relentlessly on the enemy, wherever they may go, and will surely pierce them, thanks to the combined powers of pursuit and accuracy ingrained in its Rule. Temujin is not one to let go of a grudge, and does not forgive cheaters and traitors. He will pursue them relentlessly and mete out his revenge without fail. In the past, he was betrayed by one person he trusted above any other, and truly sincere trust no longer comes easily to him. His yumi is a Sacred Artifact passed down from his great grandfather, whose arrows will find their target no matter what. Based on the legendary Mongolian Warlord Genghis Khan, whose birth name was Temujin. Temujin's parentage draws from a Mongolian creation myth which states that the Mongols are descendants of a mythical blue wolf who mated with a deer, giving rise to a people who embodied the virues of both. hope so, they may just be hanzo skins though. Poor boy just wants a harem of his own. Temujin is just Mitsuhisa cosplaying Hanzo. I... never noticed that before. Considering he was drawn by Gamma, its no surprise he looks like Kouya from Morenatsu just a bit older and more wild. 99% sure this man doesn't know how babies are made. This page was last edited on 28 January 2019, at 08:30.